Like new! The classic Conrad Veidt silent movie horror. Great retro video - nice! The expressionistic silent with cool sets and acting. A carnival magician keeps a somnambulist under his power to commit murder by night. A psychotronic original! CABINET OF DR. CALIGARI (1919/Silent Classic/Goodtimes/LP). CABINET OF DR. CALIGARI (1919/Silent Film Collection/Timeless/SP). CALLING DR. DEATH/STRANGE CONFESSION (1943-1945/Universal/SP). Like new! A horror thriller starring Tab Hunter. There's something very scary about a young boy's bedroom closet. Supernatural forces are at work there creating a world of terror. Stars Errol Flynn and Olivia De Havilland. Flynn as the doctor tuned pirate in the 17th century. Like new. CAPTAIN MIDNIGHT (1942/Complete Serial on 2 Tape Set/VCI/SP). Like new! Just missing shrink wrap....Englewood Entertainments pristine print of the classic CARNIVAL OF SOULS with Super-psycho-rama stereophonic sound. After a terrible car accident a woman sets out for a new life as a church organist. She is haunted by zombie-like specters. Low budget and creepy. The granddaddy of old dark house flicks. A creeping cat killer, hidden panels, corpses falling from closets and a terrified heroine. Plus, HAUNTED SPOOKS (1920) short feature follow CAT AND THE CANARY on this VHS from Kino. Astronauts find a cave on the moon filled with women in leopard-skin outfits...? Okay, I'm game. What is their evil intent on the spacemen? Far-Out and wacked-out! CHAMPAGNE FOR CAESAR (1950/Vincent Price/Englewood/SP). Never seen this? Another one of the scariest ghost movies of all time. Stars George C. Scott. Terrifying ghost story. Chan is investigating murder after murder. It appears that the killer could be a giant cobra. One of the most dark and shadowy Chan pictures; A film noir feel and gritty characters. Sidney Toler as Charlie Chan and Mantan Moreland as Birmingham Brown. CHARLIE CHAN AT THE OPERA (1936/Warner Oland, Keye Luke and Boris Karloff/Fox-Key Video/SP). CHARLIE CHAN: THE CHINESE CAT (1944/MGM/SP). CHILDREN OF THE CORN II (1992/Terence Knox/Paramount/SP). Six friends in a theatrical troupe dig up a corpse on an abandoned island to use in a mock Satanic ritual. It backfires with deadly consequences. Four episodes: Season One's Maddest Moments, The Mob Rules, The Green Slime and The Special Live Show. Chen Shan travels to Shanghai to fulfill his brother's dying wish. Martial Arts action. Stars David Carradine and Christopher Lee. A young martial artist embarks on an adventure, encountering other martial artists in battle until one day he meets an aging blind man who will show him the true meaning of martial arts and life. The Ray Harryhausen masterpiece of special effects. Excellent condition....three tape box set of the Universal signature monster movies: DRACULA (1931), FRANKENSTEIN (1931) and THE WOLF MAN (1941). Boris Karloff in his first Universal color film as a madman keeping a woman's corpse in a sub-basement. He's hypnotizing crazy. Also stars Turhan Bey, Susanna Foster and Gale Sondergaard. Stars Maureen O'Hara and Macdonald Carey. Fun old rockin' sock 'em western from Universal. Karloff, Price, Lorre and Rathbone is this AIP classic horror-comedy. Before the Beatles "Anthology," this was the very best Beatles documentary with early footage as well as break-up period and beyond. Really well done with narration by Malcolm McDowell. Cavern Club to the rooftop concert. Gatefold VHS. CONQUEST OF THE PLANET OF THE APES (1972 Playhouse Video/SP). A Lugosi poverty row fave. Bela is using the blood of young woman to keep his wife youthful. Dreadfully delightful, with Lugosi giving it his all. Rare! -- Original Rhino release. Also known as: THE STRANGE WORLD OF PLANET X. Scientists are drawing cosmic rays from outer space. The rays begin affecting insects and spiders...making them grow...and grow. Cool British sci-fi! Stars Forrest Tucker. Jim Danforth dinosaur! Living in lake. Crater Lake. Actors aren't animated. "He's got NO head!" That's how this atmospheric, well-acted Sci-Fi winner kicks off, with a character expounding on a victim. Forrest Tucker and a British cast excel as a radioactive mist full of monsters creeps down the alps. Original British title: THE TROLLENBERG TERROR. "He's got NO head!" That's how this atmospheric, well-acted Sci-Fi winner kicks off, with a character expounding on a victim. Forrest Tucker and a British cast excel as a radioactive mist full of monsters creeps down the alps. Original British title: THE TROLLENBERG TERROR. Like new! This is the Hollywood Movie Greats edition of CREATURE. Released before the Universal/MCA issue. This was licensed by Universal to Hollywood Movie Greats briefly. Great condition. The classic gill-man-monster movie! Third and last entry in the gill man (Creature) series. The creature undergoes some surgery and goes berserk ripping up apartments, throwing people like they were as light as dolls and being nasty (but misunderstood). Beautiful box art, like new! A space craft (large piece of flat sheet metal and cardboard) lands and a monster (carpet scraps and car hoses) terrorizes a community. This is the MST3000 version with Mike Nelson. The horror anthology by George Romero! Bugs, living corpses, creatures under the stairs and alien fungus! A throwback to "Tales From the Crypt," wonderfully executed. Stars Hal Holbrook, Adrienne Barbeau, Fritz Weaver, Leslie Nielsen, E.G. Marshall...what a cast! A follow-up to CREEPSHOW, and quite good! Another horror anthology that stars Lois Chiles, George Kennedy, Dorothy Lamour and Tom Savini as "The Creep." Great horror stories brought to us by George Romero. One fun, creepy night of horror tales here. 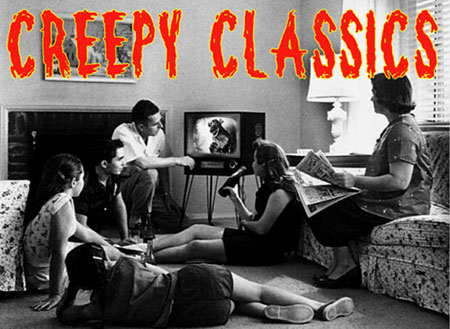 A 30 minute collection of trailers and classic horror movie clips - hosted by Vincent Price! CRITTERS 2 (RCA NEW LINE/SP). CRITTERS 3 (RCA NEW LINE/SP). Vincent Price is at odds with a witch who's got her mind set on vengeance! A werewolf like creature is summoned and other demons to repay Price for his raiding and murdering of a coven of witches. Like new. CRYPT OF THE LIVING DEAD (1973/United/SP). Like new! The super rare colorized version. An intriguing tale, beautifully filmed in a style that bears more resemblance to a Grimm’s fairy tale than horror, with a mesmerizing performance from Ann Carter. This is her film and she is strong and convincing in the role. One of Val Lewton's classics! One of the scariest movies to grace horrordome's hallowed halls. Dana Andrews is great as the unbeliever. Wait, wait...what's this? Someone has slipped me a rune...heh, heh. You'll never forget the look of this beast! It was used for the cover of a classic Famous Monsters magazine. Roy Scheider (JAWS) stars in this creepy horror! Oliver Reed in Hammer's werewolf tale! Great, great make-up! Like new! Note: This is a PAL format VHS. Won't play in most USA players. Stars Oliver Reed. One of the most ferocious looking werewolves ever. A glossy Hammer production of a boy cursed to be a werewolf. Class "A" Hammer Horror!